We're always available to help you with your eDirectory, whether it be quickly answering questions, giving detailed answers, or providing fast and simple solutions - that's what our support team is here for. Our amazing support team is always on hand to help you overcome any obstacles you may encounter, through email, online through our support portal, or with a simple call, we're here to help. We know it can be tough to get your site up and running, our team really cares about your project. So don't be afraid to get in touch with us, no matter the request. Contact us via chat or email. Our support team has 18 hours of coverage per day, and we typically respond to all emails on the same business day. 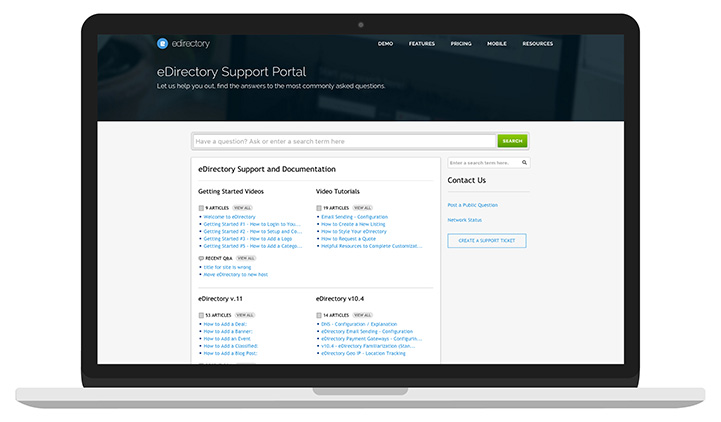 Self serve support is available from our online knowledgebase support.edirectory.com. Simply type in support.edirectory.com, or if you are on the homepage of eDirectory, click on Menu in the upper right-hand corner and click Support. It includes screenshots, developer tips, video tutorials, and so much more.